Surabordin “Ai” Prachumsri has been hired to take the helm as UC Merced’s second head coach in women's volleyball and the first alumnus to become a head coach for the campus. Prachumsri brings a combined seven years of experience as a student-athlete and assistant coach of UC Merced’s men’s volleyball team. 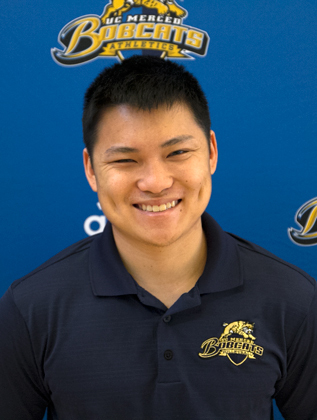 Prachumsri has been a member of the UC Merced men's volleyball coaching staff for the past two seasons, assisting with administrative responsibilities and recruiting. He joined the women's volleyball program as the lead assistant for the 2015 season, which was the team’s most successful to date — the Bobcats finished 14-10 overall and 6-4 in California Pacific Conference play. As a student-athlete, Prachumsri competed as a member of the men's volleyball club team for three years. In 2013, when the program advanced to the intercollegiate level, he started at the libero position for UC Merced’s inaugural squad. He graduated with a bachelor’s degree in bioengineering in 2014 and was honored on the Chancellor's List each year he attended UC Merced. While on campus, he served as the intramural sports student coordinator and as a student-athlete learning assistant, helping tutor fellow student-athletes. The Bobcats open their season Aug. 17 against Menlo College in Atherton.